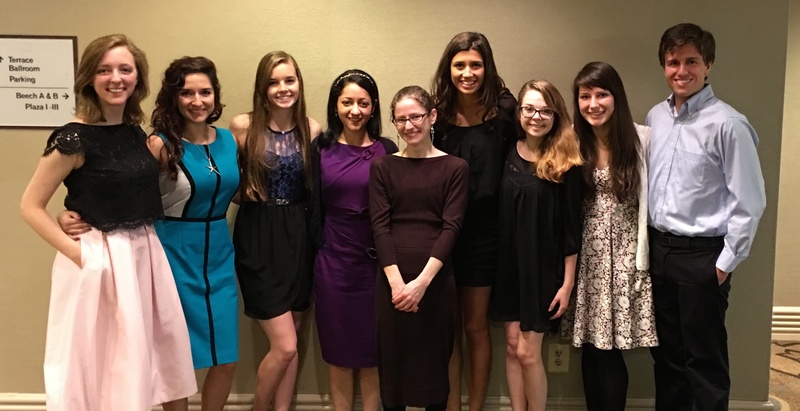 Eight Belmont members of Alpha Chi National Honor Society, led by faculty sponsor, Dr. Mélanie Walton, assistant professor of philosophy, presented on their academic research at “Transcending Boundaries: The 2016 Alpha Chi National Convention” in Washington DC. The three-day convention featured more than 300 student presenters representing all academic and artistic disciplines and culminated in a gala awards banquet with a keynote presentation by the Pulitzer Prize winning journalist Sonia Nazario. Founded in 1922, Alpha Chi is the oldest and most prestigious Greek society at Belmont, and membership in the society is Belmont’s highest academic honor awarded. Membership is by invitation, only, as determined by faculty endorsement of the quality of character and intellect of junior and senior students ranking academically in the top 10 percent of the University as determined in the fall and spring semesters. Alpha Chi’s mission is to promote academic excellence and exemplary character and to honor students who achieve such distinction.